I live in one of those neighborhoods where almost everyone decorates the outside of their home for Christmas. From late November to January, the tiny 1100 block of Hill Street in Greensboro puts on a resplendent show of Christmas festivity. Cars inch down the road gawking at the unique and colorful displays. Last year I wrapped the big cherry tree in my front yard with several thousand twinkling white lights. 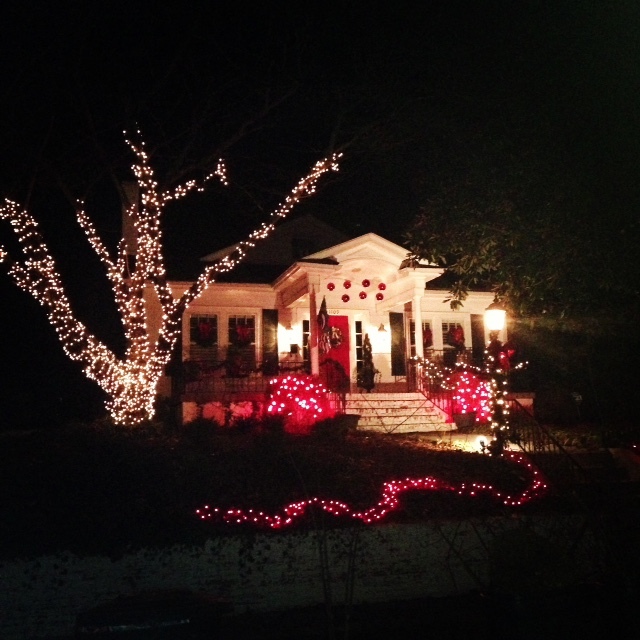 Large old-fashioned red bulbs spill over the azaleas by the wrought iron railing while oversized Christmas balls float on fishing line above the canopy over my entryway. The house across the street could rival the Griswold’s. With the help of a professional decorator and a newly added electrical circuit, Christmas lights transform this brick bungalow into an enchanted English cottage. The sloped roof hangs heavy with glistening icicles. Lights strewn on the ground create the illusion of a meandering stream. Dazzling illuminated spheres made from chicken wire are suspended from tree branches like rainbow colored fruit. Another neighbor’s home resembles something out of Whoville. Trees are wrapped and their branches punctuated with illuminated exclamation marks of color. Columns are striped like crisp red and white peppermint sticks, which melt into pink as their tops spread wide like outstretched fingers over the front porch. Two houses down, some fifty feet above the ground, a huge star is cradled like a heavenly body between the limbs of an old oak tree. The family who lives here tragically lost their teenage son several years ago. At random times throughout the year, the star is exchanged for a giant red heart. The light serves as a reminder to all of us of loss and love. I was recently talking with a nurse in the Oncology unit of Cone Hospital. She said her patients often drive down our street following their chemo and radiation treatments. I imagine the sight of the brightly lit decorations lifts their spirits and for a moment, helps them to forget the seriousness of their condition. On winter evenings, I walk my dogs down the street, pausing to admire decorations that are as colorful and diverse as the personalities who live in each home. I am thankful for the time and effort put forth by my neighbors in a gift that so many of us can enjoy. From the ancient winter solstice festivals of the Druids to our modern day Christmas, celebrations of light have been observed for centuries by nearly every culture around the world. While many of us are familiar with Hanukkah and Ramadan festivals in the US, less familiar is the Japanese festival of Obon Matsuri. I’ve seen spectacular photographs of hundreds of floating lantern “boats” as they were released onto rivers where it is believed they float downstream to the spirits of their ancestors. As human beings, I believe we are also meant to shine. By honoring others through acts of service and kindness, we are like candles whose flames are touched end-to-end. We share and amplify the glow of our individual lights, without our own light being diminished. We claim power over the darkness and cast warmth into an otherwise cold world. We shine to let others know they are not alone. We shine to bring comfort and to ease one another’s suffering. We shine in honor of the sacrifice that was paid to give spiritual meaning to our physical lives on earth. Through shining our light, we make manifest the glory of the divine spirit that is present in all living things. From Hill Street to your street, may you all have a bright and shiny Christmas and a dazzling New Year! And you and Perry are lights in my life! You are an amazing woman Linda fields! And don’t you forget it! We love you!! !